During the hearing, most of the time was spent on the plaintiff’s fourth complaint that the law violated Article 2, Section 5, of the constitution that prohibits public money from being used to aid a private, sectarian institution. The judge explained that a distinction can be made between a sectarian institution and an institution with only a religious affiliation. The judge’s point being, Article 2, Section 5, only prohibits aid to sectarian institutions — not to religiously-affiliated institutions. Article 2, Section 5, of the Oklahoma Constitution is commonly referred to as a Blaine Amendment. Most states have some form of a Blaine Amendment in their state constitutions. Oklahoma’s Blaine Amendment is one of the most broadly worded of any found in other state constitutions — its prohibitions are not limited to our public school system. This ruling now calls into question other government programs in health care, foster care, prison ministries, subsidized daycare for low-income working Oklahomans, and higher education tuition assistance grants to name a few. The ruling does not address the question of how the government should decide which private schools are sectarian and which are only religiously affiliated, and begs the question: should the government even be making such determinations? It is unlikely that the ruling will ever result in the need to make such determinations. The judge acknowledged as the hearing began that district court decisions on cases of this nature are almost always appealed and said that a final determination in this particular case is best made by an appellate court. Within hours of the ruling, Oklahoma Attorney General Scott Pruitt announced the State will file and appeal in the case. With agreement from both sides in the lawsuit, the judge stayed his ruling, which allows the scholarship program to continue without interruption while the case is appealed to the Oklahoma Supreme Court. All of the hysterical claims by opponents in 2010 that this law would have devastating effects have not happened — except one. Opponents said the law would lead to numerous lawsuits. That turned out to be a threat — and one that they made good on when two school districts sued parents in 2011 for using the program. A Tulsa County district court judge ruled, without explanation, that the law was unconstitutional but her decision was thrown out by the Supreme Court. Opponents regrouped and filed the same lawsuit last October with new plaintiffs and defendants. The other side continues to demonstrate a pathological hatred for this common sense program and a disturbing indifference to the challenges faced by the students who really need the options provided by this law. This lawsuit is the second attempt by a small group to limit the educational options available to children with special needs to only the public school in their neighborhood. The administrators of Jenks and Union school districts in 2011 sued the parents of children with special needs who obtained scholarships. The Oklahoma Supreme Court rejected the lawsuit in 2012 allowing the program to continue benefitting hundreds of children. I’m hopeful the Supreme Court will do so again on appeal. 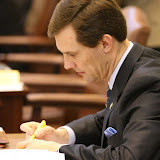 The Lindsey Nicole Henry Scholarship for Students with Disabilities Program Act was passed by the Legislature in 2010 and signed by former Gov. Brad Henry. The Act allows a student with a disability who is on an individualized education program (IEP) to receive a state-funded scholarship to attend a private school chosen by his or her parents. The scholarships are funded with money already designated for the child’s education. Qualifying students began benefiting from the program during the 2010-2011 school year. The program has grown during the last four years to include more than 300 students. Students from both urban and rural parts of the state have been able to use this option to choose a school environment that gives them an equal shot at getting the education they need and deserve. The Legislature expanded the law earlier this year as support for the program grows. I often hear from parents who tell me how the opportunity provided by this law to access an education that meets their child’s unique needs has been life changing. The parents of four different children have told me in emotional conversations and emails that the opportunity to attend a different school using a scholarship saved their child’s life. The Lindsey Nicole Henry Scholarship law helps children who need it most, and it does so without harming anyone. Without this important option, hundreds of children would be forced back into their resident public schools that were not meeting their educational needs. I’m thankful for the hard work of Attorney General Scott Pruitt and his staff in defending this important law — specifically Solicitor General Patrick Wyrick and Assistant Solicitor General Sarah Greenwalt. Their arguments in defense of the program are strong, and I believe they will be effective in the appeal. This is a fight for equal opportunities in education for our most vulnerable students. It is a fight that I and many others inside and outside the Legislature will continue because these children deserve, want and need a good education — not just an opportunity to sit in a classroom or attend a school that is not meeting their needs. I will keep fighting to defend the right of parents to do what is best for their children — even when it comes to their education.